Three women have been arrested after they led police on a pursuit through Pasco County and it all started after someone reported seeing the women naked at a Pasco County rest area off of I-75 on Wednesday. 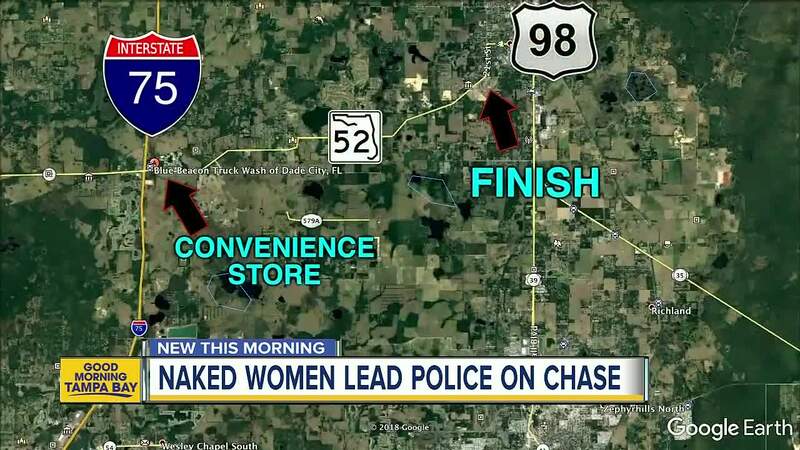 WESLEY CHAPEL, Fla. — Three women have been arrested after they led police on a pursuit through Pasco County and it all started after someone reported seeing the women naked at a Pasco County rest area off of I-75 on Wednesday. On Wednesday, April 10, 2019, at approximately 11:15 a.m., an FHP trooper was dispatched to the suspicious persons call at the northbound I-75 rest area just south of State Road 54. When the trooper arrived on scene, she found three black females completely naked. The women told the trooper they had showered and were "air drying." Troopers say the girls told them they had been at a relatives house in Lutz and got into an arugment. They had no where else to shower, so they bought soap and water and bathed themselves on the grass outside the rest stop building. The girls got dressed before speaking to troopers. As the trooper was attempting to gather their information, the three women ran and got into a white 2009 Nissan Sentra and traveled southbound into the northbound rest area entrance before turning back around and heading northbound before traveling north on I-75 toward State Road 52. The trooper initiated a pursuit, but the pursuit was canceled due to the pursuit not fitting FHP criteria, according to FHP. A citizen called *347 to report a reckless vehicle and stayed on the phone with FHP dispatch to provide location updates. The car turned east onto State Road 52 and another trooper spotted the car which was briefly driving in the wrong direction and then turned back eastbound on State Road 52. The trooper initiated a pursuit for the reckless driving and deployed StarChase projectiles which allowed the troopers to back off and for dispatch to coordinate FHP response and perimeter activities. Dispatch tracked the car as it pulled into the convenience store parking lot located at State Road 52 and Curley Road where troopers found the car empty. As the three women exited the store and got into the car, a trooper attempted to take one of the women into custody. While the trooper was trying to arrest that woman, the driver purposely drove directly at the trooper who had to jump away to avoid getting hit by the car. One of the women exited the car with a metal bat in an effort to hit the trooper. Another trooper witnessed this attempt and rammed the suspect car with his marked patrol vehicle and then the women got away in the car once again. The women traveled eastbound on State Road 52 with the two troopers again in pursuit of the car. Dade City Police Department responded to the area and deployed stop sticks which successfully deflated the right side tires of the suspect car. One of the troopers was authorized to PIT the car due to the aggravated assault charges and the totality of the circumstances, according to FHP. The chase ended at State Road 52 and 21st Street in Dade City. A trooper had to break out the vehicle windows because the three women refused to get out and resisted arrest. They were interlocking their arms together in the car when the trooper broke the windows. The trooper tasered all three women and took them into custody. They were taken to the Pasco County Jail. "Total insanity!" Norma Urig said. She is on her way to Georgia from Fort Meyers. She swung into the same rest stop off I75 Thursday to use the restroom. "As all places I mean, people know what a rest area is for and it certainly isn’t that," she said. She’s blown away by what witnesses say they saw here Wednesday. She often times brings her grand kids on this trip with her. She believes the girls put troopers and other drivers at risk. "What if they had been with me? That’s not something I would want them to see," she said. "They’re there to protect us. What if someone desperately needed an officer or medical care while you’re playing goose with them." FHP says several of the troopers involved sustained minor injuries during the pursuit. The driver, Oasis Shakira McLeod, 18, and the two passengers, Jeniyah McLeod, 19, and Cecilia Eunique Young, 19, were charged with Fleeing to Elude, Resisting arrest, aggravated assault and lewd acts.